In a recent New Yorker (June 26) article, Bill Buford narrated his dessert making experience at Room 4 Dessert in New York. In the article he historicizes the word dessert. Its etymology is French, from desservir or de + servir, "the thing served after all the plates have been removed." After lunch this afternoon, I realized that I needed a reason not to return to my desk. So, I prepared dessert, or an early afternoon tea. 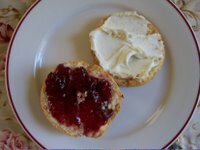 I spread four-fruit preserve (Bonne Maman) and mascarpone cheese on an Italian short cake and brewed a cup of Zawadi Pure Black Tea. 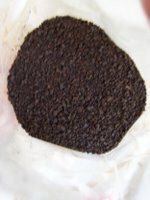 The brewed tea without milk or sugar had a dry, berry flavor; with milk and sugar, reminiscent of tea time in Botswana: rich hibiscus and creamy dark chocolate flavors.